Reunion welcomed a near-record crowd with 2,147 alums and over 1,000 family members and guests. Attendees hailed from 47 states, 22 countries, and 2 territories. This year’s 50th reunion class, the Class of ’66, broke all previous attendance records; so did the three youngest classes (2016, 2011, and 2006). Approximately ten attendees from the Class of '41 and 20 from the Class of '46 also made the trip to campus. Ilyssa Greene Frey, director of communications and marketing for the Wellesley College Alumnae Association (WCAA) described Houghton Chapel as being “packed to the gills” for Stepsinging Friday night (around 1200 songbooks were handed out by 8:30pm). 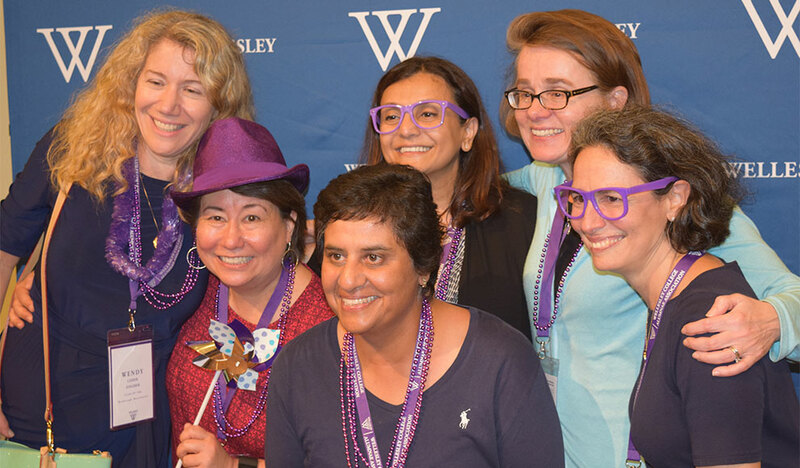 On Saturday, “The “W” Returns!” –an activity formerly known as “Float Night” where alumnae cheer fellow alums rowing barges who come together to create the Wellesley “W” on Lake Waban—proved to be very popular, as did the Three Presidents Panel. The panel, a standing room only event, brought together former presidents Nannerl O. Keohane ’61 and Diana Chapman Walsh ’66 and current President H. Kim Bottomly for a conversation about how “the liberal arts has shaped their paths to leadership in both personal and professional ways.” It concluded with a surprise appearance by incoming president Dr. Paula Johnson, who received a standing ovation. In addition to the panels, lectures and scheduled events, alumnae also found time to reconnect with their classmates and have a little fun on their own. The Class of '66 set up plastic flamingoes (their logo) in the shape of a huge 66 on Severance Hill Friday afternoon. On Saturday morning, reunion attendees awoke and were amused to find that the Class of '01 had rearranged the flamingoes overnight in the shape of 01. Student volunteers put the 66 back only to find that, by Sunday morning, the Class of 96 had also joined in the fun changing the shape to their class year.